Filter Mats, Media Nets, Waterfall stones & more! TJB-INC has put together a list of all of the replaceable products for the Classic Series BIOFALLS Filters including the MicroFalls, Mini BIOFALLS, Standard BIOFALLS, and the Grande BIOFALLS Filters. The main photo will change as you select the different items from the box above. 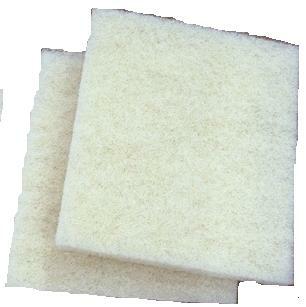 Biological Filter Mats - Should be replaced every 2-3 years or some of our customers like to start each year with new pads. The Classic Series Mats are either rectangler except the Standard mats which are trapizoidal. Classic MicroFalls Mats = (2 needed) 11" x 15"
Classic Mini BioFalls Mats = (3 needed) 18" x 20"
* NOTE: The Grande simulated waterfall stone is a very large item and have to ship UPS Oversized and have its shipping weight priced for "Dimentional Weight".